Lekhana: What’s it all about? The Lekhana literary weekend promised to be interesting. The venue for one, the NGMA, is stunning. The NGMA is currently hosting an exhibition of paintings by Rumale, that in itself is worth a visit. But back to the literary event. Well, it’s no Jaipur. But, having said that, it has many things going for it. The discussions were erratic though – some were great (like the panel on translations, the panel on the short story), while others were very average. They had a few author readings (which I bunked), but a nice surprise were the short 5 minute plays that were staged in the courtyard. They were funny, irreverent and well-acted by a skeletal cast of 2 – 3 actors (and put me in a spot when my seven-year old son, who was watching along with me, wanted to know what ‘homophobic’ was). The best part for me was all the learning. I have added so many more books to my reading list – not least the many translations of classical Kannada and Tamil texts, which just seem so damn interesting! I also discovered the online magazine Outofprint.com which focuses exclusively on short stories – and they’re really good. In a fit of enthusiasm, I have subscribed to a delicious bi-monthly magazine called Books & More (for the princely sum of Rs 180 per year). I have been exposed to the world of self-publishing and e-books (which, btw, with my new Kindle – thank you Rohaan!) I can now download and read. All in all a good weekend, wouldn’t you say? 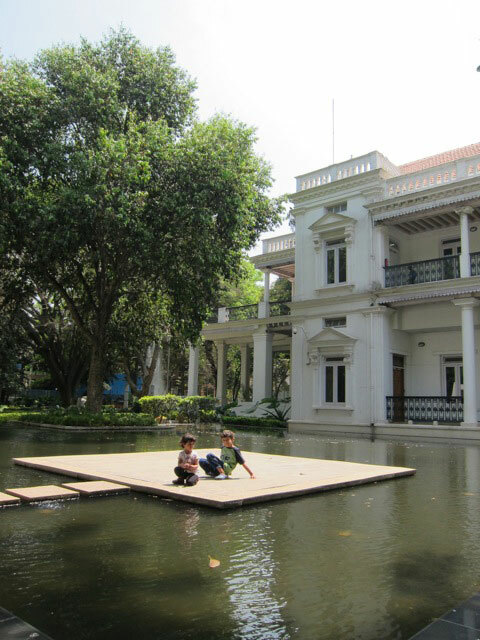 Brother & sister posing @ the NGMA.